I bet you think I think about winter all the time. Well, it’s true. When I’m running up a trail in summer, I imagine skiing back down if only it were winter (or even just running straight into a snowbank to cool off). But the converse is also true. I think about summer in winter. 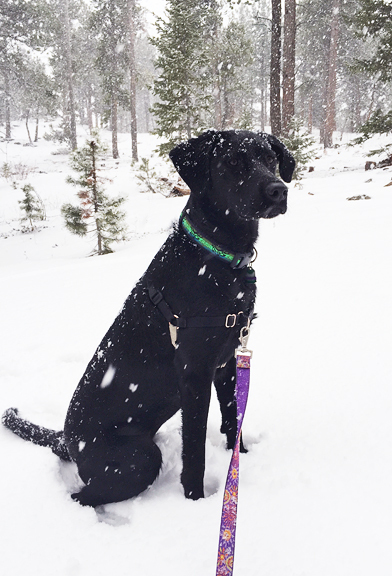 Just the other day I took Neva for a hike on the local trails when the snow was falling at a good clip, and pointed out places on the white ground where shinleaf, pasque flowers, and other flora bloom in the months of long daylight. For me, it’s all about the place and how it changes so dramatically from season to season, but still remains constant in my heart. I have noted where the best aspen stands reside. I have strong mental associations with those special locales that offer up chanterelles, porcini, wild strawberries, wild raspberries, and most of all – huckleberries. Even more so if I can ski there in winter! Perhaps I’m mistaking my obsession with huckleberries as “thinking about summer” despite the fact that they only make their entrance in the last half of the season. I forage for (and freeze most of) those blessed berries like crazy for a few weeks and research ways to prepare and share them for the rest of the year. This week I finally tested a seared duck and huckleberry gastrique (a sweet and sour sauce) recipe that has been on my brain for a long while and it just so happened to coincide with our wedding anniversary! Truth be told, our anniversary sneaks up on us each year. We rarely plan anything around it. 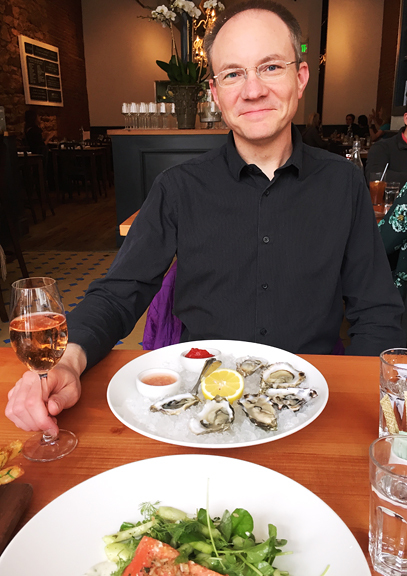 On a whim, I picked Jeremy up from work and took him to The Kitchen for a light snack of oysters and sparkling rosé as a “celebration”. Once home, I realized we had some leftovers from my recipe testing, so I said, “How about that for dinner?” and Jeremy nodded enthusiastically. 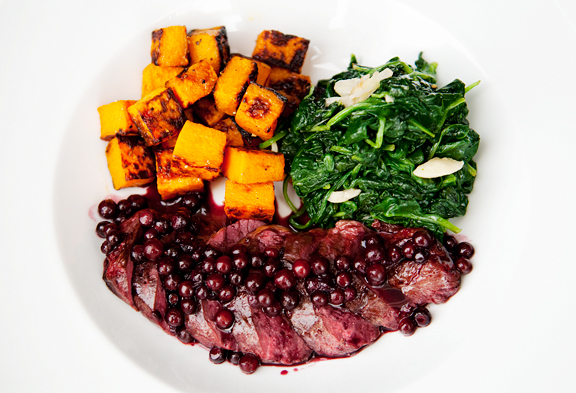 The biggest obstacle for me to make this recipe was not huckleberries, but duck. I’ve had a lot of trouble tracking down duck breasts in Boulder (go figure – locals, if you have a source, please share the information with me!). As luck would have it, my friends Erin and Jay gave me a couple of frozen wild duck breasts recently. They happen to have friends who like to hunt duck, but don’t care to eat them (what the!??!). While that was happening, I went ahead and ordered some frozen farmed duck breasts online. So now I had two kinds of duck breasts! 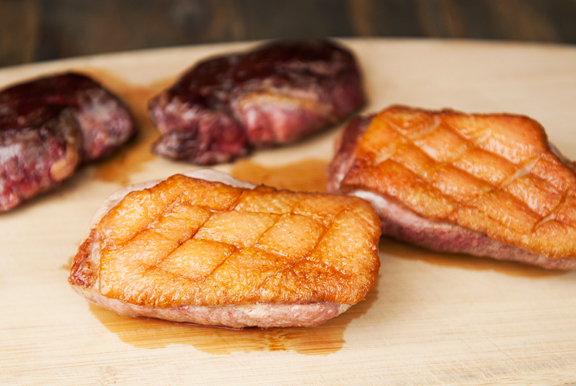 The farmed duck is White Pekin and the flesh is much lighter in color and milder in flavor than the deep burgundy and more “gamey” wild duck. I was psyched to compare the two. The wild duck breasts didn’t come with skin, which is a bit of a shame because duck skin is the best thing ever. Searing the duck is no big deal and pretty straightforward. 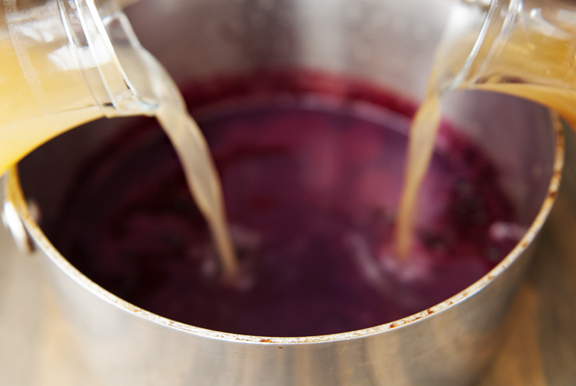 Making the huckleberry gastrique is what takes up the bulk of the time and effort – mostly babysitting liquids as you reduce them to syrups. I used roast chicken stock instead of duck stock, because I happen to have that on hand at any given time. [I tend to save all roast chicken carcasses and bones in gallon freezer bags and make large batches of stock in my pressure cooker.] I couldn’t find veal stock anywhere and decided to substitute half beef broth and half roast chicken stock instead. The things you can learn from a Google search! If you have access to huckleberries, use them. If you don’t, consider ordering frozen hucks online. I don’t know how well blueberries will work in place of huckleberries – probably fine, but blueberries lack the nice acidity and floral notes that make the huckleberry so special. As for the zinfandel, the original recipe appears on the Dry Creek Vineyard website and calls for the Dry Creek Heritage Zinfandel, obviously. We were really underwhelmed with the 2014, so I think you can perhaps save yourself some coin and buy a fruity, low-tannin zinfandel for the gastrique. 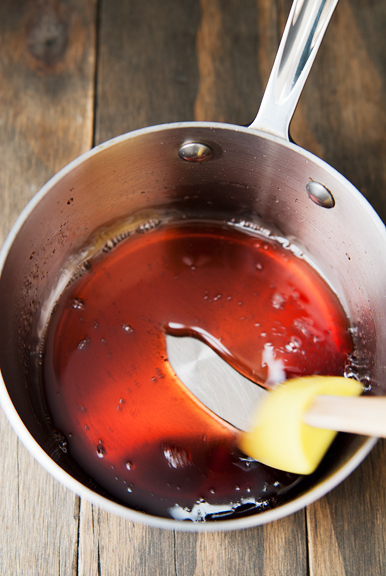 To start the gastrique, you essentially make a caramel syrup from the sugar and the red wine vinegar. 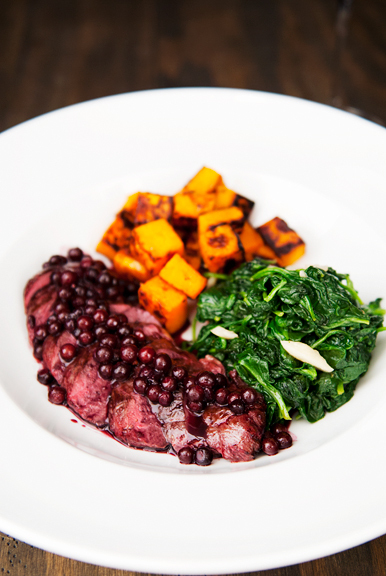 This is what gives the gastrique its signature tart-sweet flavor which pairs so perfectly with huckleberries and duck. I reduced the vinegar-sugar mixture down to about a third of the initial volume until it was syrupy, but not too syrupy. It will thicken quite a bit when it cools. 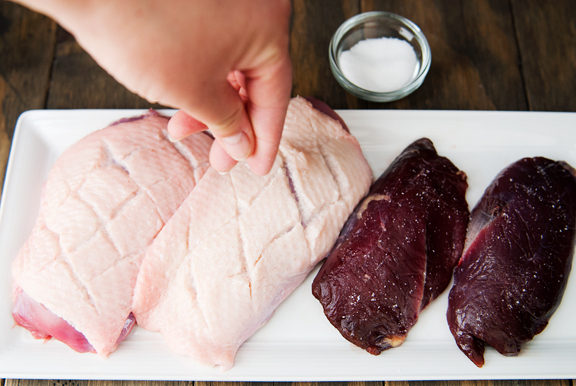 At this point, pat your duck breasts dry and score the skin in a criss cross pattern. This helps to prevent uneven shrinkage during pan-searing as the skin wants to pull inward, but the rest of the duck doesn’t. Don’t cut through to the flesh, just enough to allow the skin to contract without deforming the meat. Lightly salt both sides of each breast and let them rest for a half hour to an hour (about the time it takes to finish the sauce). 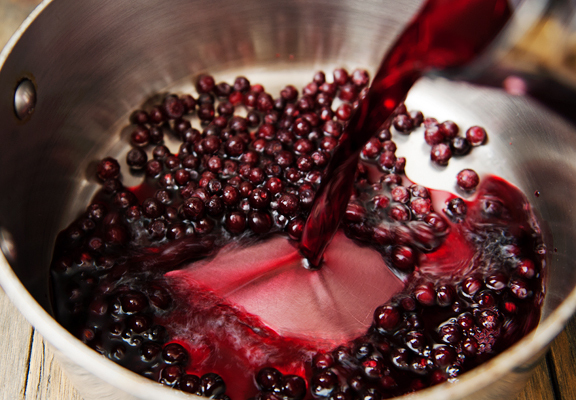 In another, larger saucepan, reduce the wine and a half cup of the huckleberries to a syrup. This took me about 15-20 minutes at a steady boil. Next, add your stocks to the wine reduction. Does it make a difference if you use chicken stock versus roasted chicken stock? I think so. I mean, you can use chicken stock, but I’m telling you that roasted chicken stock packs way more flavor and suits this sauce well. Reduce the sauce by half (another 15-20 minutes). Stir in some, but not all of the caramelized vinegar mixture. Give it a taste and adjust the amount until you attain the right balance of sweet and tang in your gastrique. I used all of my vinegar syrup. Lastly, stir in the remaining berries. You can conceivably make the gastrique ahead of time, because we’ve reheated it (gently) after a day or two in the refrigerator and it’s perfectly lovely. So if you wanted to serve a fancy meal without all of the headache of making it in one fell swoop – do the gastrique a day or two early. In fact, if you do that, perhaps you want to stir in the remaining berries after you have warmed up the sauce. Just a thought. I’m always thinking about making your life a little less crazy, you know. The duck should be prepared right before serving because it is best served rare to medium rare and reheating it won’t do the bird justice. Get a skillet or sauté pan nice and hot and set your duck breasts in skin-side down. The skin is going to release a lot of gorgeous duck fat which you should use to occasionally baste the tops of the breasts. It will also make a splattery mess, so I used a splatter guard to save my kitchen and myself from the overzealous splattering. For the duck breasts sans skin, I waited to pop those into the pan until a layer of melted duck fat lined the bottom. The breasts will be ready to flip once the skins are browned and crisp. That’s my favorite part. Give the duck a good sear for a minute, then transfer them skin-side down to a baking sheet lined with foil. These go into a 350°F oven for a few minutes until they register about 135°F on a meat thermometer. 135°F is for medium rare, 125°F for rare. Once the duck is done, remove the breasts from the oven and let them rest for a few minutes before slicing. I prefer to slice my duck thick rather than thin. It also avoids shredding the precious crisp skin. 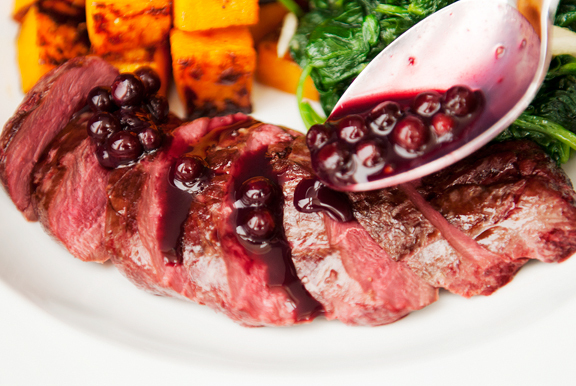 Fan the slices out and spoon the huckleberry gastrique over the duck. Don’t skimp on the sauce or the berries! 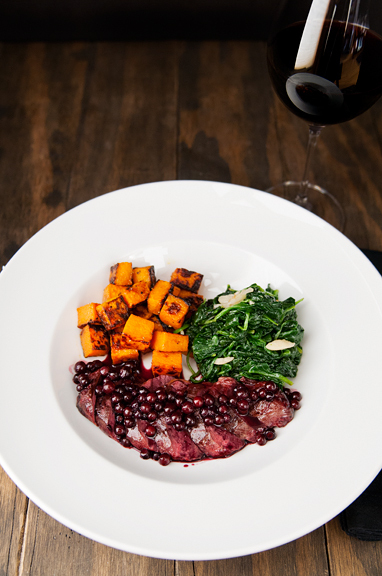 This is the first savory huckleberry recipe I attempted and it was amazing! Both the milder farmed duck and the more intensely gamey wild duck worked so well with the huckleberries. I think this may be my favorite fruit and duck pairing ever. The sauce is a perfect balance of sweet, tart, and savory which complements the flavorful umami of the duck. 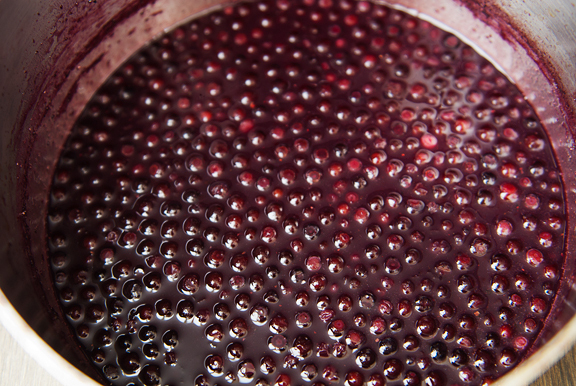 I have a hunch that the huckleberry gastrique would be terrific with seared or grilled pork or wild salmon, too. So if you’re a duck hunter and you don’t like to eat duck… you know who to call. 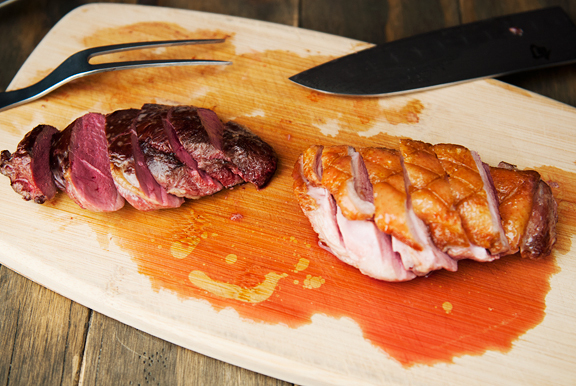 Use a sharp knife to score the duck skin of each breast in a criss cross pattern, about a 1-inch grid. Lightly salt the duck breasts on both sides and set aside. 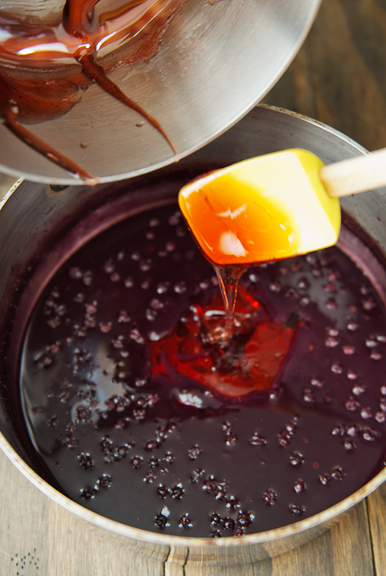 In a small nonreactive saucepan, combine the sugar and red wine vinegar. 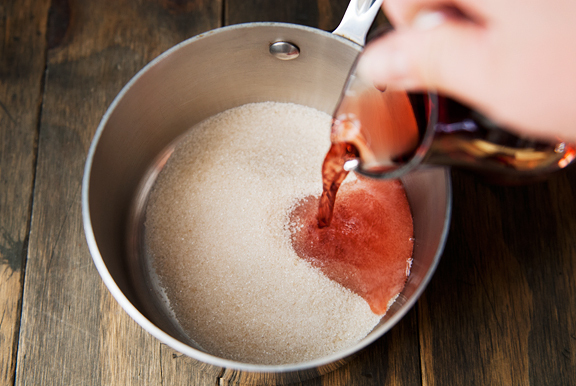 Set over medium heat and stir to dissolve the sugar, then let the mixture boil until it reduces to about a third of the original volume. [The fumes will be quite potent, so open a window and run your hood vent.] When the liquid becomes syrupy enough that a spatula dragged across the bottom of the pan leaves a part for a second, remove from heat and set the vinegar syrup aside. 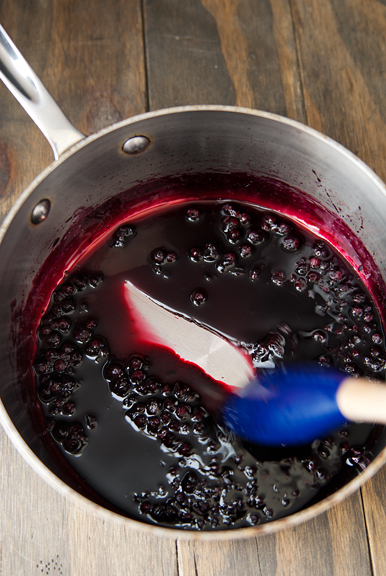 In a larger saucepan, combine the wine and 1/2 cup of the huckleberries. Set over medium high heat and bring to a boil. 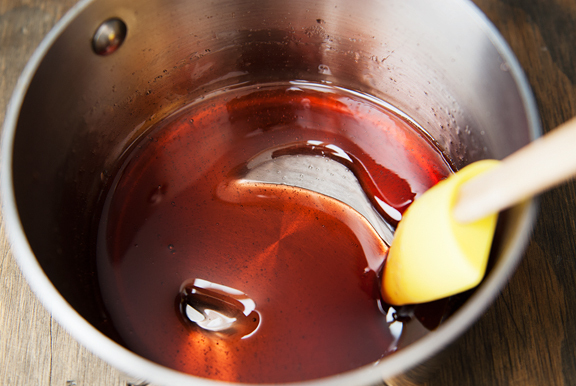 Reduce the liquid until it is thick and syrupy (about 15-20 minutes for me). Add both stocks to the pan. Reduce the liquid by half (about 15-20 minutes). Stir half of the vinegar syrup into the sauce. Add more to taste until you achieve the right balance between sweet and sour. Stir in the rest of the huckleberries. Season with salt and pepper to taste. Preheat the oven to 350°F and line a rimmed baking sheet with aluminum foil. Heat a large sauté pan over high heat. 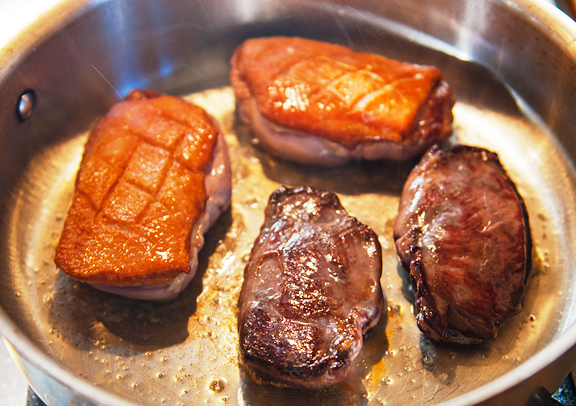 When the pan is hot, place the duck breasts, skin-side down, in the pan in a single layer, taking care not to crowd them. Reduce the heat to medium and cook the duck, basting the tops of the duck breasts with the fat from the pan on occasion, until the skins are browned and crisp. Turn the breasts over and cook for another minute until seared. 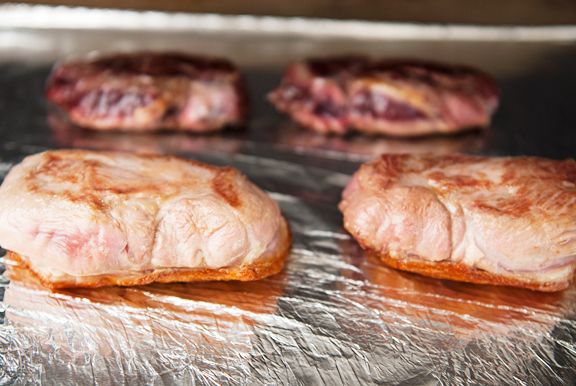 Remove the breasts from the stove and place each one skin-side down on the baking sheet. Bake in the oven for four minutes or until the duck is rare to medium rare. Medium rare should register 135°F on a meat thermometer inserted into the thickest part of the breast. Remove from oven and let the duck breasts rest on a plate for a few minutes. 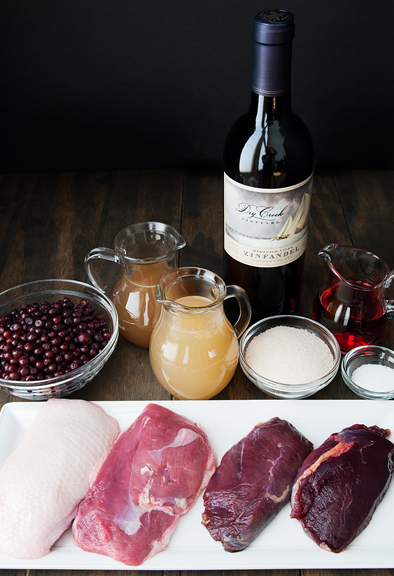 Slice each breast and serve with the huckleberry gastrique. Serves 4. 4) I’ve never had the pleasure of tasting a huckleberry, but have made an almost identical recipe with elderberries and it was really good. 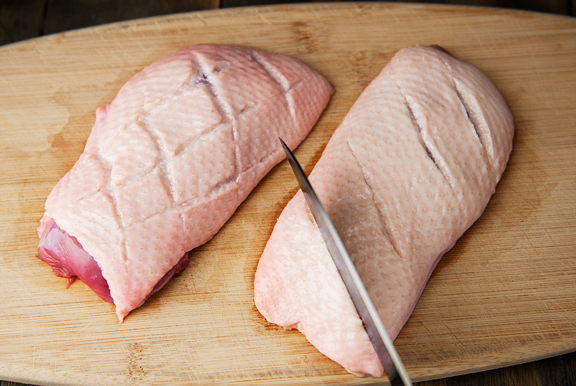 5) why is it so damn hard to get fresh duck breasts? I live in Ohio which is the poultry capital of the world and I can’t ever get them. Happy Happy Anniversary to both of you!! The duck looks yummy! I’m with you…..where’s all the duck with all this local growing/farming around! Happy Anniversary to you and Jeremy! I can’t help out with Boulder, but Marczyk’s in Denver on Colfax always had duck when we lived in Colorado. Now that we’re in France, it’s such a staple that it’s much easier to find, but sadly, I don’t think we have any yummy huckleberries. Happy “hunting.” I hope you find some duck closer to home soon. Joyeux anniversaire de mariage! I feel very sorry for everyone in the US who doesn’t have easy access to duck breasts! Like Trish, I’ve been living in France for many years now and that is one of the bennies! I have found frozen Canadian duck breasts when I go home to NH but they are not easy to find. And huckleberries I have yet to taste! Beautiful! Love the look of this recipe and will try for sure! I buy my dear huckleberries at NorthWest Wild Foods… they come with dry ice in 2 days and I can make jam and crisps all winter. We always have duck in our freezer so I am going to have to try this, I wonder if you could also wrap it in some bacon and grill it, then pour the sauce over? Wonderful recipe to hang around with. SAJ – thanks for all of the sweet comments! Also, what a great idea to use elderberries! If you CAN try a huckleberry, though – I highly HIGHLY recommend it. There are several places to order them frozen online :) And yeah, I don’t know what the deal is with getting duck. Makes me wonder if I should take up hunting just so I can get my own! Alexis – I feel sorry for us, too! :) But you must try to find a huckleberry someday. I think you will love it! Sarah – thanks for that tip! I’m drooling just looking at their selection of wild berries!! Amy – I am certain you could do that. Sounds amazing! Dear Jen, I am late and I am way behind reading your blog – having less time now… so sorry. Nevertheless I want to send my congratulations and best wishes to you and to Jeremy for your Anniversary! It’s so great seeing you still being so lucky and happy together after that long time. Wow! Looks so good. I love duck. Which duck did you end up preferring? Irmi – thank you! The elderberries sound like a lovely substitute. Let me know if you try it! Esther – I liked both for different reasons. Probably would have liked the wild one better if the skin had come with it!